R.R. Marshall: Steve, you were in attendance to see the Patriots prevail against both the snow and Oakland Raiders and come from behind to post a spine-tingling 16-13 victory in overtime. Already people are calling this the greatest game in franchise history, what do you think? Steve Grogan: It was an exciting game but the first three quarters were very disappointing and even kind of boring, but the fourth quarter and overtime was as exciting as it gets. It may very well have been the best-ever, and it was nice to win such an important game to close out the life of Foxboro Stadium. The place has gotten a lot of bad raps over the years but it was still a great place to play and watch football, and this game will leave people with a great feeling about the old place. No one sat down during the entire second half, and my knees were killing me but if was a lot of fun. The elements kind of made things special, like when you were a kid and went out to play football in the snow. I’m sure it was a special game for the players as well and they had a lot of fun. It’s funny but nobody left after the game! The stands were still full after the teams had left the field, nobody wanted to go home! It was just one of those special, special moments. RRM: You’ve played in games with all sorts of bad weather. How bad were the conditions for the players in this game? SG: I was down on the field before the game and they had the field covered up until about two hours before kickoff and the ground was still pretty soft beneath the snow. It was a dry, fluffy kind of snow as opposed to a wet, slick snow, and I think that made a difference. But the conditions were as bad as the famous Snowplow game against Miami in Foxboro in 1982. The only difference was back then the stadium had an artificial surface and the turf tended to get slick when it was snow-covered, as opposed to grass where you can at least get your cleats down through the snow into something that will hold. RRM: Everyone expected to see the Patriots come out and try to run the ball down the Raiders’ throats, and instead they moved the ball through the air on that first drive. What was your reaction? SG: They came out throwing the ball which shocked everyone, including me. They didn’t score on that first drive and you kind of wonder if it ended up working against them because they showed the Raiders you could move the ball with the pass in those conditions. When you run the ball on a field like that you have to get your running backs going straight ahead, and it makes it hard to run outside. You can’t run pass routes where your receivers change direction that much. Fortunately the Patriots throw a lot of that short stuff so footing was not a major issue for them. But the fact that the two teams combined to put the ball in the air over 80 times in the game really shocked me. I just couldn’t have imagined that before the game. RRM: The Patriots generated little offense for the first three quarters, going 0-6 on third down conversions in the first half. Did that offweek result in them accumulating a little rust? SG: I don’t think it was the week off that affected them. I think they were trying to figure out what they could do on the field, and for three quarters I thought the Raiders handled things better than the Patriots did. It didn’t look too good for them at the start of the fourth quarter trailing 13-3. I didn’t think there was any way they could score twice in those conditions. The Raiders veteran experience was paying off for them, but once the Patriots offense went to the no-huddle and the coaching staff allowed Brady to start throwing the ball all over the field it seemed to inject the offense with new life. They got a rhythm going and the entire flow of the game changed at that point. RRM: Everyone is still talking and analyzing what will probably become known as the Tom Brady “non-fumble” in years to come. What was your take on the play, was the right call made? SG: When I first saw the replay on the big screen at the stadium I turned to my son and told him there was no way that call was going to be reversed. So I was a little surprised when referee Walt Coleman overturned the call and ruled it an incomplete pass. After I examined what the rule states the official called it exactly the way the rule is written, so I think it was a good call. Anybody that was watching the play on TV when it occurred I’m sure had doubts because it looked like he was trying to bring the ball back under control. But the rule says if the ball is not back and tucked then it’s an incomplete pass, and that is exactly what happened on that play. I think this rule needs to be evaluated and reviewed over the offseason. I’m sure the Oakland Raiders and their fans will be cussing over this one for years to come like we did with the infamous Ray Hamilton “Roughing the Passer” call out in Oakland in that 1976 playoff game. RRM: Speaking of that game, it was just over 25 years ago that referee Ben Dreith made that infamous call that cost the Patriots the game. Has that sour memory finally been laid to rest with this big win? SG: I’ve talked with a lot of people the last few days about that call, and if this new call the other night was vindication for that one. My response is it may very well be vindication for the Patriots’ fans, but for those of us who played in that game we’ll never be satisfied. That team went 11-3 after going 3-11 the year before, and it was probably the best Patriots team I ever played on, including the 1985 team that went to the Super Bowl. We had traded Jim Plunkett over the offseason and gotten a bunch of first round draft picks that we used to get players like Mike Haynes, Tim Fox, and Pete Brock, players that were with the team for a long time. We felt like we were a better team than the Raiders, and we had them down in their place and felt we had the game won. Then on an incomplete pass on a third-and-18 situation with time winding down Ben Dreith called what we considered a phantom roughing the passer penalty on Hamilton, but back then there was no instant replay like today. A 21-17 win turned into a 24-21 loss, so you can understand when I say that we’ll never be happy with that one. I heard Ben Dreith was interviewed just recently and said he would have ruled the Brady play a fumble, now why doesn’t that surprise me? RRM: Ironically the play involving Brady could have been called roughing the passer, as Oakland’s Charles Woodson delivered a good forearm shot to his head while knocking the ball loose. I’m still looking for that 15-yard penalty? SG: Someone else mentioned that to me, about the shot to Brady’s head and when I looked at it a little more closely on the replay you have it exactly right. Woodson could easily have been called for roughing the passer on that play. In today’s game usually any blow to the quarterback’s head warrants a flag, which was not the rule back in 1976. The irony of the play didn’t escape me, but in a year in which everything seemingly has happened I guess it just adds another chapter to an incredible season. 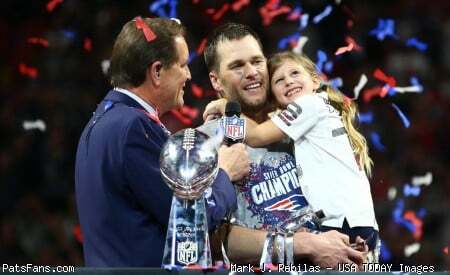 RRM: There were still some doubters who wanted to see what Tom Brady would do in his first exposure to the postseason. When you complete 32 passes to set a new team postseason record in conditions like that I guess you have to say he responded pretty well! SG: I think that anyone who still had doubts about him found out what they needed to know about Tom Brady in this game. People were calling him lucky and that may very well be, but he’s the kind of quarterback that makes plays when he needs to have them. He’s not spectacular, he doesn’t throw the long bomb but he manages the game well and makes the throws to keep drives moving. If you would have told me before the game that Tom Brady was going to throw the ball 52 times in those conditions to win the ball game I’d have bet the ranch that it couldn’t be done, but he did it anyway! RRM: Once Brady started firing in the final quarter he couldn’t miss, repeatedly finding David Patten and Jermaine Wiggins for steady gains. Were the Raiders paying too much attention to Troy Brown and leaving them open? SG: Aside from one big catch Troy Brown was not a major factor in this game, but that’s what so appealing about this team. There’s no superstars so when you take away one guy, one or even two others step up in their place. Wiggins and Patten made big plays all night, and who would have thought after making only 14 catches all season long Wiggins would catch 10 in a playoff victory. When these kinds of things happen it just makes you think of this club as a team of destiny. RRM: No less an authority than former Patriots All-Pro kicker Gino Cappelletti anointed Adam Vinatieri as the greatest placekicker in team history. After he hit two clutch field goals to pull out the victory who’s to argue with him? SG: [Laughing] Gino might have gotten just a little bit caught up in the emotion of the moment, but Adam Vinatieri is a very good kicker who is as mentally tough as they come. He was successfully able to block out all the weather conditions that surrounded him as well as the pressure of the situation and deliver when his team needed him most. The kick he made that tied the game up and sent it into overtime was one of the greatest clutch kicks I’ve ever seen considering the conditions. To drive that ball 45 yards through the snow was simply amazing. When they were lining up to attempt the game-winning field goal in overtime everyone was acting like the game was already over (the scoreboard operator already had the points on the board!). I was telling everyone seated near me that you couldn’t take anything for granted with the conditions on the field. Vinatieri could have slipped on his approach to the ball and we may have continued with the overtime. But he lined up and banged it through the posts, and you have to give him a lot of credit. RRM: Only one game and one team is standing between the Patriots and a trip to New Orleans for Super Bowl XXXVI, and that is the Pittsburgh Steelers in this Sunday’s AFC Championship Game. What can you tell us about the Steelers, and what do you think about this matchup between the two clubs? SG: They’re going to have to go down to Hynes Field in Pittsburgh and play a mistake-free game like they virtually did the other night. They’ll have to play good defense and keep Kordell Stewart in the pocket and prevent him from running around and killing them with his legs. The Steelers are very good along the defensive front. Their linebackers are very athletic and they can do a lot of things including blitzing. They will put a lot of pressure on Brady and he’s going to have to be able to handle it or it will be a long day for the Patriots. I think the Patriots are going to have to throw the ball a lot, and I imagine we’ll see those screen passes that have been so successful for them in an attempt to slow down that Steeler pass rush. But they are still going to have to try and run the football in this game. Antowain Smith may have appeared to have been a nonfactor against the Raiders, but he still had 20 carries for 65 yards and if they can get just a little bit out of him it will help to take the pressure off of Brady having to throw the ball 50 times again. I don’t think they can win a high-scoring, shootout type of game mostly because it’s going to be difficult to score over 20 points against the Pittsburgh defense. RRM: Who should we hand out game balls to for this one? SG: You have to single out both Tom Brady and Adam Vinatieri for their efforts. I think you also have to reward David Patten (eight receptions) and Jermaine Wiggins for the big contribution they made. On defense Ty Law played a great game, making 10 tackles and keeping the Raider receivers in check. On this evening there were so many people who contributed to the win, and these were just some of the players who rose to the occasion. RRM: What are Grogan’s grades for the playoff win over the Raiders? SG: I’m going to hand out A’s all across the board. This was too big a game to mark them down for any deficiencies. They didn’t play very well for three quarters but I don’t care about that, they did what they had to do and past the postseason test with flying colors. As incredible as it seems this team is just one game away from the Super Bowl. Although this game against Pittsburgh will be their toughest game of the season this team has answered the challenge every time this year, so I’m not about to write them off now. This entry was posted in Uncategorized on January 21, 2002 by Steve Grogan & R.R. Marshall.